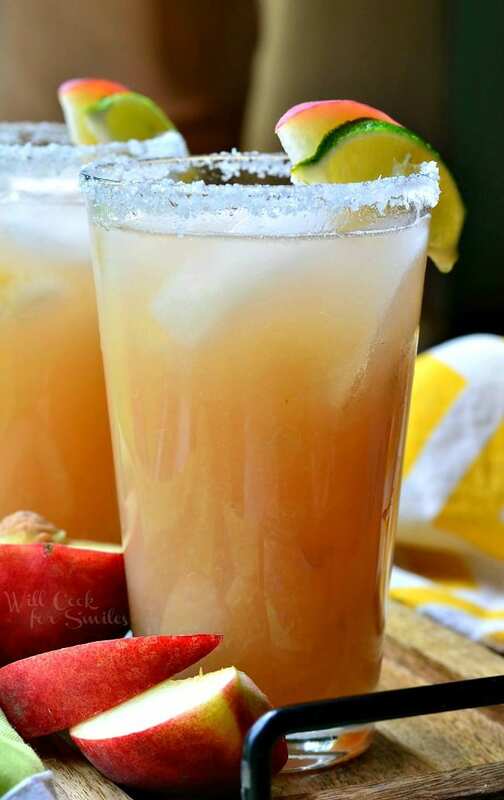 Refreshing frozen margaritas to enjoy outside in the warm weather. 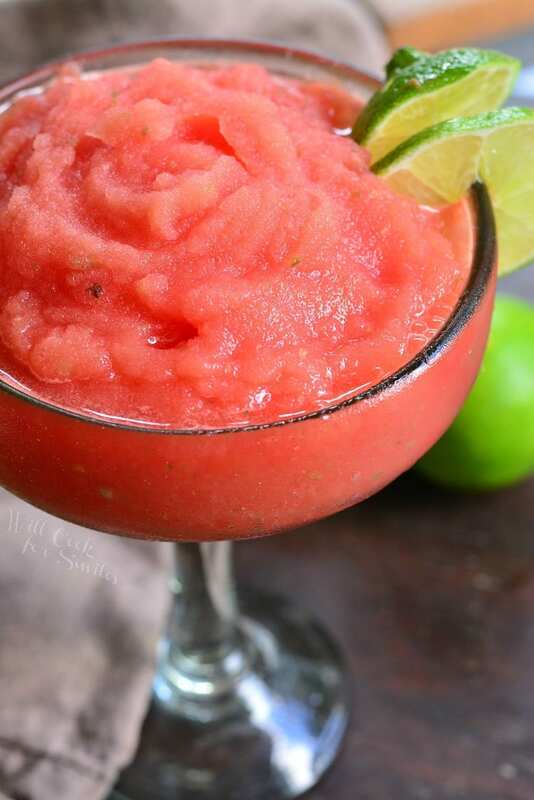 These tasty Watermelon Lime Frozen Margaritas are simply made with only 3 ingredients. 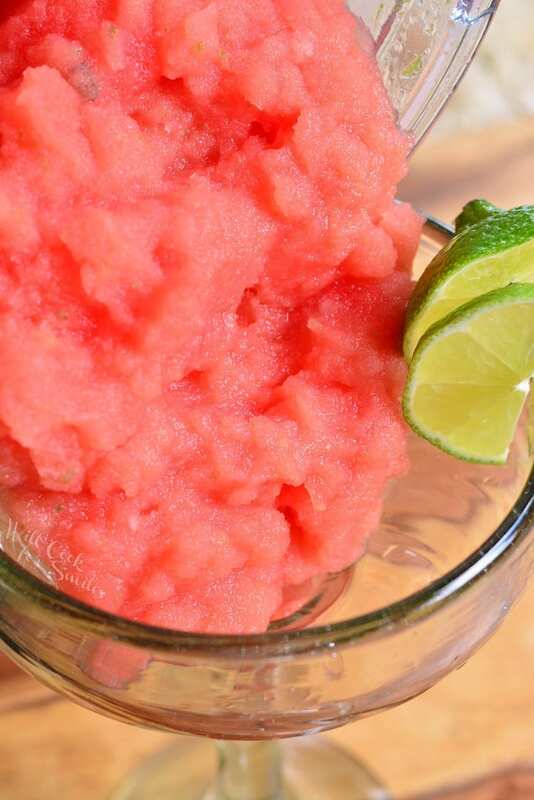 As long as watermelon is frozen ahead of time, it will take just a few minutes to blend and serve. This week feels like a week-long July 4th celebration. I’m actually not as excited about it as you might think because the neighbors are driving me a little bananas. It’s not me that is celebrating but rather listening to the constant boom of fireworks around the neighborhood late into the night. Oh, and running back and forth to calm the baby and the pet after each boom. We are running and hiding on the actual July 4th! Our neighborhood gets so crazy with fireworks, it’s like being in the middle of the firework itself while it’s being set off. Kiddos and I can’t sleep until about 2 am. Believe it or not, my little guy would rather sleep than go and watch fireworks and the baby has been scared by just the few that have been set off this weekend. So we’re running away to a more peaceful place…my mommy. I vaguely remember the times, before the kids, when we’d go to the beach or downtown to watch the fireworks and party all night. Now, just thinking about it makes me cringe. The traffic to get there plus over an hour spent just looking for parking is too much. Not to mention the traffic to leave that is never-ending, all the “less than sober” people around, and I remember a lot of chaos in general. All that sounds like a fun day at the beach when you’re a care-free college student but now, sparklers in the backyard and a BBQ at home seems like a much better option. So I’m grabbing the kids and we’re heading for my mom’s house, whose neighbors are not as loaded with fireworks as mine are. Peaceful family celebration and lots of margaritas is what’s in store for me this holiday week. 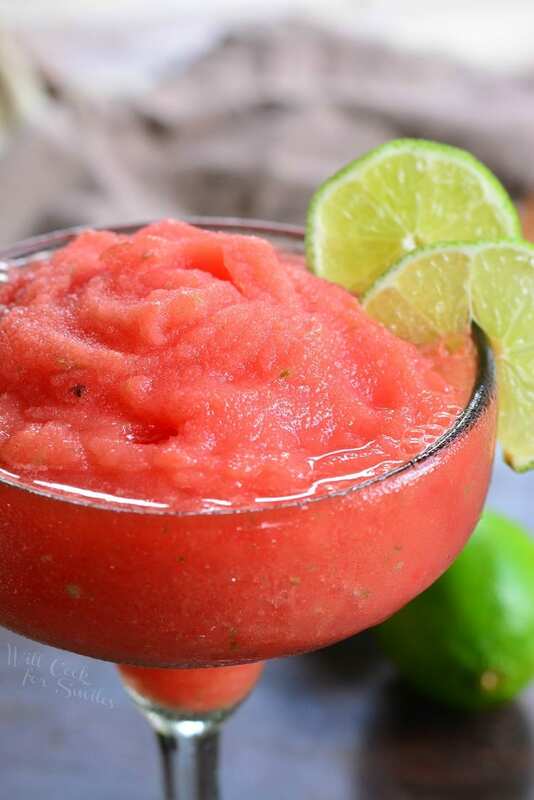 Yes, frozen margaritas and some tasty grilled chicken kebabs sounds like the perfect Fourth of July evening. Kids are getting the giant sparklers that they love, so everyone will be happy. You know what I love the most about these margaritas? I love that all I need are 3 ingredients and a strong blender. The worst part about a frozen drink is always the fact that it melts and you are left with a watered down drink. More often than not, frozen drinks are made with ice so it waters down the drinks as it melts, especially in the hot weather outside. To keep my blended drinks from being weakened by melted ice, I simply freeze the fruit that I will be using to make it. Of course, I have to remember to do that ahead of time and it works if you’re using the actual fruit and not a mix. Start by getting a nice, juicy, seedless watermelon. Cut the watermelon into slices and cut off the rind. Cut watermelon meat into about 1/2 inch cubes. 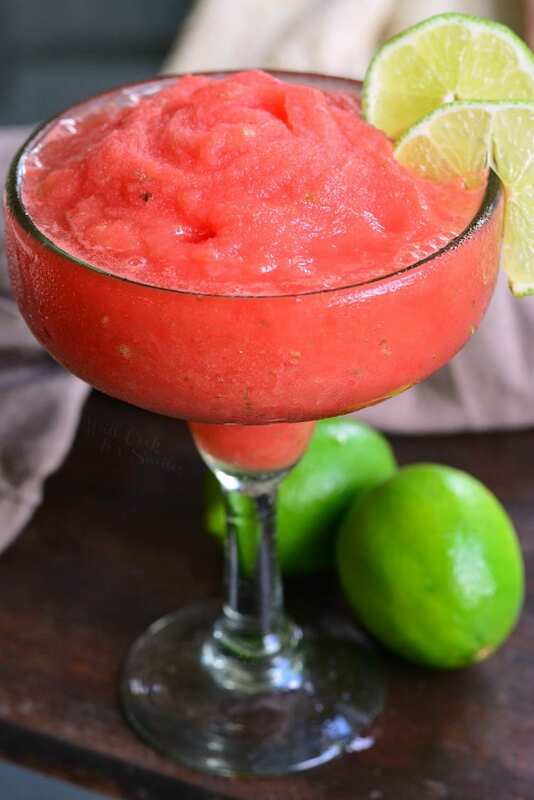 When you’re ready to make some frozen margaritas, just take out the freezer bag, hit it on the counter a few times to break apart the watermelon, and place as much as you need into the blender. Add some lime juice, lime zest, and tequila. Blend until smooth and enjoy! You can add salt or sugar to the grass rim if you wish. 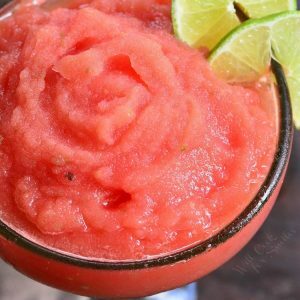 Delicious blend of frozen watermelon, lime, and tequila that make a perfect cocktail for a hot summer day. 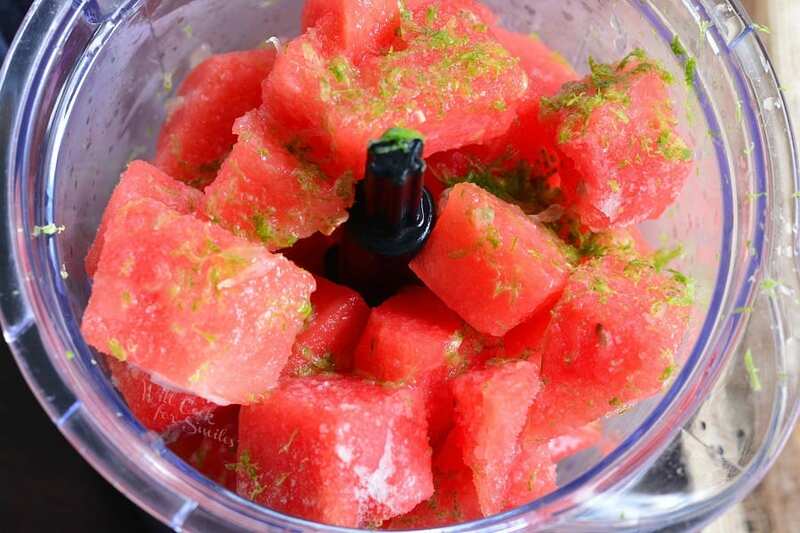 Cut the watermelon into slices and cut off the rind. Cut watermelon meat into about 1/2 inch cubes. 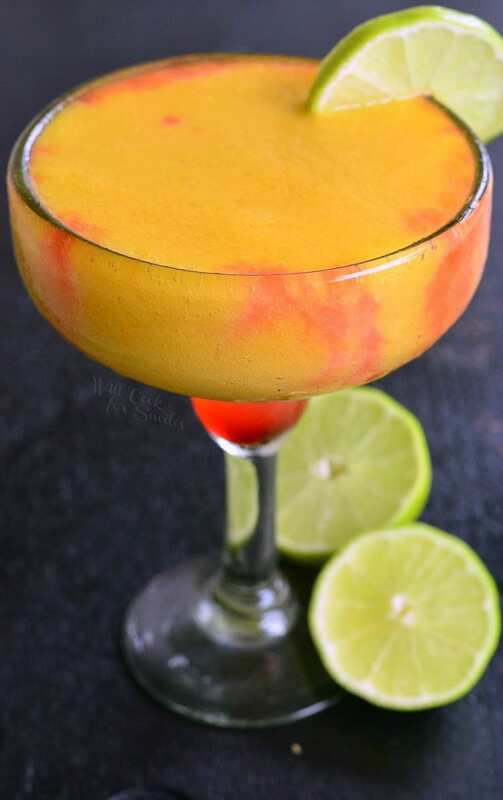 Add lime zest, lime juice, and tequila to the blender as well and blend until all smooth. Depending on how much you need to make at a time, cut the recipe in half or thirds to make separate batches of margaritas. You can adjust amount of tequila according to your preference. 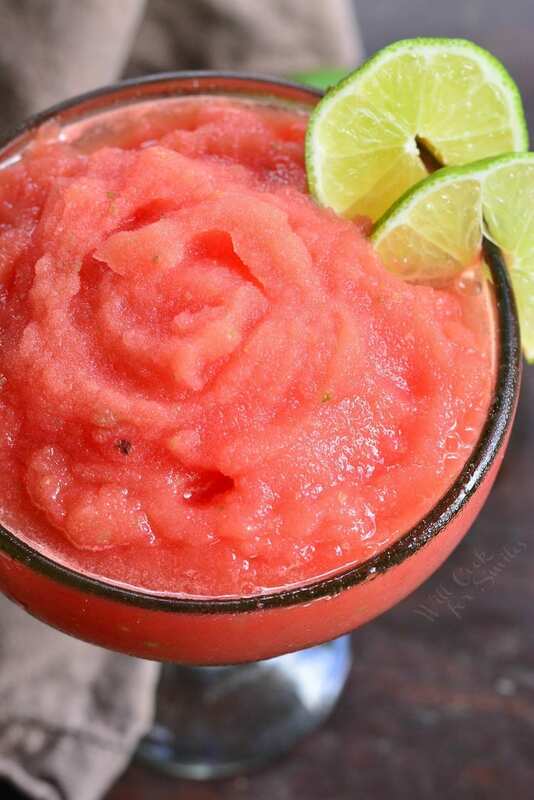 Note: watermelon is already pretty sweet so adding a sugar rim will make this cocktail quite sweet. You may choose to add salt to the rim or nothing at all.